Pink Lemonade : BLOOM TOWN! Please excuse me while I wipe some of the drool off my face...! Photographer Sharif Hamza works his magic for W Magazine’s March 2012 issue, for this bright editorial named ‘Bloom Town‘ which stars model Patricia van der Vliet and Emily Baker. 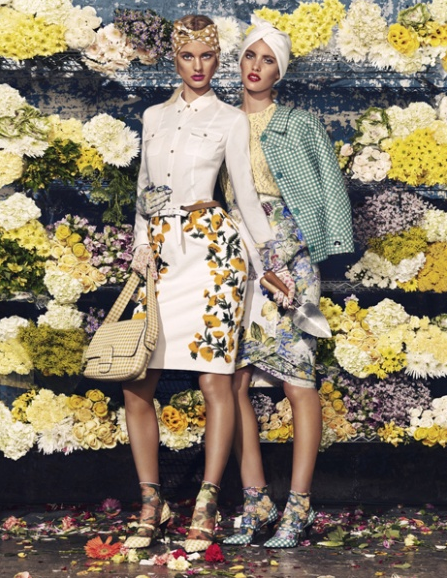 Posing in front of beautiful bright flowers, both models show off an array of Spring/Summer 2012 prints, bright accessories and more. Styled by Italian stylist Giovanna Battaglia and featuring pieces by Christopher Kane, Alexander Wang, Dolce & Gabbana and more, this is one of Hamza’s most visually stunning efforts to date. Lovely editorial! Love the images very fresh, puts you in a great mood!